Several years ago I discovered the divorce complaint from my grandmother's second or third husband. The marriage lasted less than three months. I made the comment then that if my grandmother hadn't kept a copy of the complaint, it would never have occurred to me to look in California records for a marriage or divorce. However, as records get digitized, such things matter less. The record to the left turned up for me on Ancestry this past week. 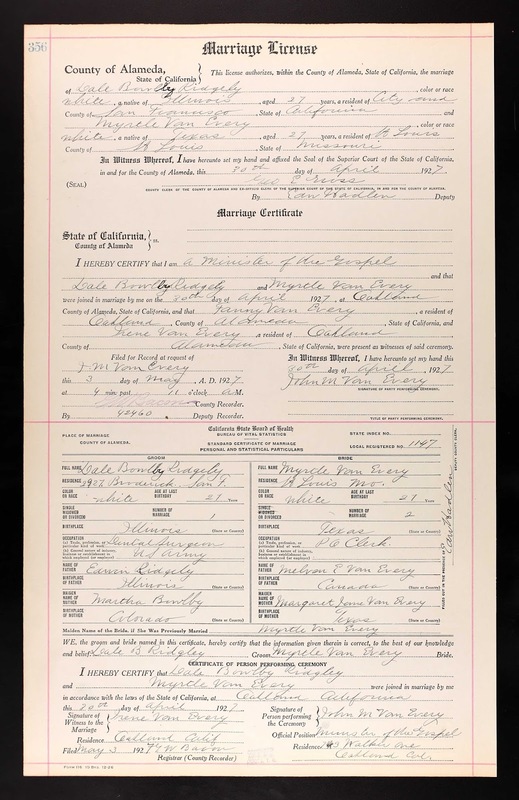 It is the marriage license and certificate for my grandmother, Myrtle Vanevery, and her second husband, Dale Bowlby Ridgely. It's a legible and quite detailed certificate, with names of parents for both bride and groom, as well as occupations for bride and groom. I was most intrigued by the surname of the minister, and two witnesses. It matched my grandmother's. However, I was unfamiliar with these relatives. Some quick research in Ancestry's family trees suggest that the minister, John M Vanevery, was the son of a John Vanevery and Louise Bartlett, and grandson of my third great grandparents, Andrew Vanevery and Nancy Lucinda Vansellas. (I'd have to do some research to truly verify the family trees, but it seems likely.) That would mean the minister was first cousins with the bride's father. The two witnesses were the minister's wife, Fanny, and their daughter, Irene. I still suspect the marriage was in California primarily because the groom was stationed in the army in San Francisco, but my grandmother did have 'family' in the Bay Area. She returned to St. Louis after the marriage ended. The certificate states that it was my grandmother's second marriage. I have records of one prior divorce from an Alfred Connevey in 1920. Letters from her parents imply an earlier marriage with a man named, Jack, that ended in 1919.